On 1 January 1901, Australia became a nation. The Federation was achieved as a result of two referendums, one in 1898 and another in 1899. In the second referendum, a majority of people in most of the colonies voted to support the new Constitution that would create the Commonwealth of Australia. The only colony in which the people did not vote for federation in 1899 was Western Australia, but the people of the west voted ‘Yes’ in the middle of 1900. In the lead-up to federation, there was a shared belief that a single, unified country would provide ordinary people with the chance to create a new and superior society. They had a vision of a nation that included the best qualities of their British heritage, while providing opportunities for everyone, not just the privileged few. However the road towards federation was not always a smooth one. There were obstacles that had to be overcome before the people were ready to embrace the idea of one nation. These included a strong sense of local identity in some areas, and rivalries among colonies. Some people were also strongly loyal to the British Crown and resisted any lessening of British power. There were also disagreements as to the exact nature of the federation that was to be created. Some wanted a stronger central government, while others wanted the state governments to have the greatest power. Then there were those who simply resisted change and were happy for things to continue as they were. Nevertheless, as the colonies approached the end of the 19th century, most of these obstacles were overcome. A majority of people voted in favour of the creation of the new Australian nation. Several other factors also encouraged this movement towards federation, including defense and economic concerns, and an increasing recognition of ‘sameness’ among the colonists. The movement towards federation is generally regarded as having begun with Sir Henry Parkes’ Tenterfield Address in 1889. However, the idea had been around at least since 1847 when Henry Grey (the third Earl Grey)—British Colonial Secretary from 1846 to 1852—proposed a Federal Assembly. The intention was that this assembly would meet regularly to allow colonial leaders to discuss matters such as customs and tariffs, railways, and postage services. However, the idea was not taken up by the colonial leaders and the movement lapsed until the 1880s. The important steps in the federation campaign are summarised in the table below. Once Australia became a federation, the issues and ideals that had formed the nation continued to be important. National identity continued to play a role in determining Australia’s economic and social policies. The nation in the early 20th century was regarded as one of the most progressive in the world. 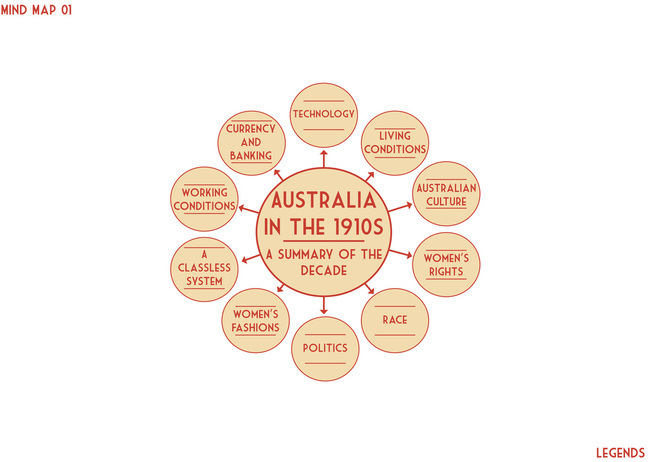 Its standard of living was high, the pay and conditions of workers were improving, women had more democratic rights than women in most other parts of the world, and the fledgling sense of Australian identity became stronger and more confident. Watch the following presentation and complete the questions at the end and the mind map below.